Work with file links to save storage space and avoid duplicates. File links don’t occupy storage space, as documents aren’t saved directly in Microsoft Outlook or on the Exchange Server. Please note: The access permissions of the original document still exist in InLoox equally whether you upload the document or you work with file links. If you add a file from a protected network folder or SharePoint store to the InLoox storage, still only authorized users can read and update it. Therefor always take the access permissions of the original document into consideration, when uploading it to the InLoox storage. 1. Open an existing project and click on Documents in the Start tab. 2. Click on the Edit tab and then on the arrow icon below New. New File: By using this feature, you can upload a document to the InLoox storage and save it to the project folder. When the Windows Explorer opens, select the document and click on Open. New File Link: By using this feature, you can create a link to the storage place of a document. The document isn’t uploaded and doesn’t occupy any storage space. When the Windows Explorer opens, select the document and click on Open. New Link: By using this feature, you can leave for example web addresses. After you have clicked on New Link, a side panel opens on the right side. In the path field you can save the web address. 3. Afterwards the new document is displayed in the document list of your project. 1. 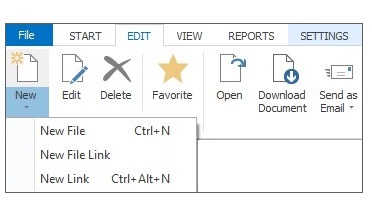 Choose the document you want to edit from the document list. 2. Open the Edit tab and click on Edit. A side panel opens on the right side. Here you can enter important information regarding the document. 3. Add information in the General area. In the Path fieldyou can see the storage place of the document. You can’t edit this field. The Status field allows you to leave notes about the processing status like in progress or completed. In the Note field you can save all important information regarding the document. InLoox provides you with the various formatting features. For more information see 7. in How to create a new project. 4. You can create links to other project elements (like mind maps, tasks …) in the Links area. 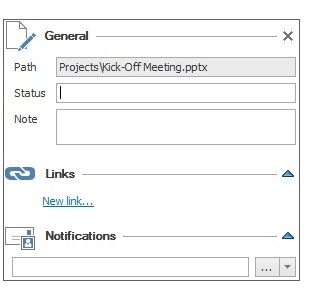 Click on New Link… and choose a project element you want to link to the document. Click on Add and on OK. InLoox displays the document as a paper clip on the page of the project element you have chosen. You can also open the document on this page. To delete the link, click on the delete icon next to it. 5. In the Notifications area you can inform other persons, like the project manager, about new documents or changes in already existing documents. Click on this icon , to select a resource. In the address book double-click on the name of the person you want to inform and then on OK. The selected resource will be notified via e-mail when you save and close the project. 6. When you have finished editing the document, close the side panel on the right side next to the General area. Your changes will be saved automatically. How to Add and Edit Project Documents in InLoox PM 8 • Copyright 1999-2019 © InLoox, Inc. All rights reserved.